This frame suited the image perfectly! It was rustic without sacrificing quality. Customers love the look of this frame with my seascapes and other Cape Cod landscapes. I think it would have been better a close-up to see more detail of this frame then the one I viewed at purchase, at first I was a little disappointed but after positive comments received at an art show has given me second thoughts. Hello Ron! Thank you for your feedback. We can understand your concern. We are currently working on adding new imagery of our frames to the website. We highly recommend that you order samples of our frames in the future. That will ensure that you like the frame before placing the order. We are pleased to hear that the frame was well received at the art show. We hope we can continue to provide you with your framing needs. Happy Framing! 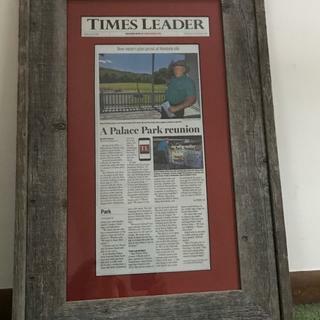 Barn wood Frame looks great! The frames were excellent quality and well put together. Rough wood is what i wanted and that's what I got. Looks great. I ordered 4 or frames of different sizes and they are very beautiful. Each one is unique in its own way. I painted a rusted out old crab boat on the eastern shore of Virginia. This driftwood frame was perfect as it matched the weathered dock and the overall weathered feel of the scene. I sold the painting just hours after framing it. I'm convinced the frame had a lot to do with it! Nice, but joints weren't all tight. Nice, but joints weren't all tight. Would recommend it. Hello Peter. Thanks for your feedback. We apologize that the corners on the frame were not joined tightly. Our goal is to offer great products and excellent craftsmanship. It sounds like this could have occurred during shipping. We are happy to send you a replacement or offer you a company credit since you are not completely satisfied. Please let us know how you would like to proceed. We truly appreciate your business. Have great day! Very nice weathered country looking wood frame. Just what we were looking for. My reclaimed barn board frame came out exquisite! It looks exactly as I had imagined and my husband loves it. Thank you for a job very well done! Perfect! Great frame, quick shipping couldn’t be happier! Picture frame was perfect and shipping was quick. It was packed to the max with protection so my frame would not get damaged. Great product as well as great quality. Thank you. Will buy again many times I am sure of it. Perfect frame for my watercolor of Beached Boats. Love it, it is absolutely perfect for the painting it frames. Great quality, always happy with whatever I order from you folks! This frame and mat turned out so nice and looks great with my art print. Beautiful frame with lovely variations in the wood. Easy to assemble the hanging materials. Makes my artwork look beautifully finished. I am now a fan! The frame was just what I needed. It was very good quality - especially for that type of rustic wood. This frame is outstanding. It added the perfect touch of rustic to a watercolor that I painted titled "Under 2 Ton", which depicts an old farm truck rusting in a field. Love the texture - knotholes, woodgrain and nail holes along with the beautiful, aged gray tones. Picture reproduction quality is great. I couldn't be more pleased. The frame is perfectly made and wood as described. It was a great choice for the chosen photo. Loved the quality and service! Looks great with the canvas painting it was intended for. This is the fourth frame I have purchased from this collection. While the material itself is imperfect, the mitered corners on my frames have been perfectly matched. This is a common problem in lesser quality production. Have been using pictureframes.com for framing needs for over 20 years (when catalog only) and am never disappointed. If you are ever not satisfied, they will quickly resolve the matter. The quality and appearance of this frame exceeded my expectations. Very high quality. Highly recommend. Beautiful frame, well made, would absolutely recommend. The matte work of this company is equally impressive. if I had seen this OFF line in person I may not have ordered. VERY rough. I've gotten splinters, several of them just holding it. The look is very rustic, so actually, you could almost call it junk!...but that is the look right. Hello Carol. Thank you for your honest feedback. 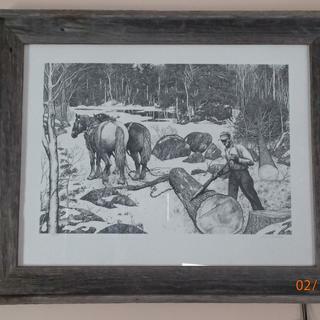 This unique frame is designed to have an authentic Rustic appearance as listed in the description. These one of a kind frames are made from real barns and present a true element of nature. We sincerely apologize you are not pleased with the frame. We certainly want to give you the best experience possible. If you would like to return the frame, please email our Customer Care Department and request a UPS return label. We can be reached at customercare@pictureframes.com. We look forward to hearing from you soon. Thank you for your business! I purchased 3 very large frames in this material. I'm pretty pleased with them, one is a little darker than the other two, but I like that look. One of the frames arrived slightly damaged and I needed to take the staple out and re-staple it. Otherwise, I'm quite pleased and everyone comments on how pretty they are. Thank you for your review Caroline. We are happy to hear that you are pleased with the frame. We apologize that the frame arrived damaged, and we would have been happy to replace the frame for you. Since you are willing to keep the frame, we are going to credit you back %15 off the shipping and handling fee. Again, thank you for your business. Framing a hand painted blue heron. Ordered the driftwood frame with white for another heron canvas and loved it. My second order. Perfect frame for the photo of a cabin taken in the Great Smoky Mtns. in Autumn. I do Cape Cod seascapes and landscapes, and these frames work well for me. My clientele on Cape Cod love this frame on my landscapes and seascapes. I wanted to purchase a Barnwood picture frame in a distressed gray look. 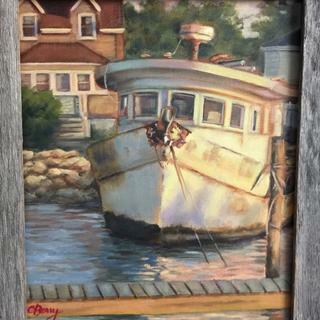 The Driftwood Gray Frame went with the rustic style and colors of the painting I was having framed. I wanted a frame with texture, something to highlight the tones and texture in my print and this frame is exactly what I was looking for. I love that this is real wood with a history! Weathered, rustic appearance will go nicely with my wolf prints. Rustic goes well with my marine/ocean photographs. I do lots of Cape Cod seascapes and landscapes. This frame completes the feel of my image which I have painted. I am dressing up my work in a finished manner. 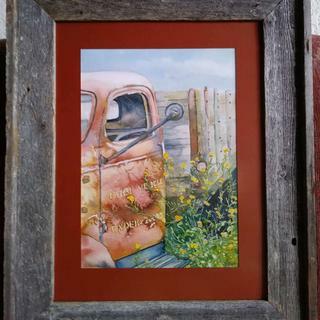 This will look fantastic framing my watercolor of an old farm truck! It matched the painting and fit well in the room in which we are intending to hang it. the color and texture complement the ocean theme of my photo. I traveled to Western Ireland and met a local artist that painted a couple memorable scenes for me. This frame reminds me of the weathered posts that dotted the landscape alongside the stone "famine" fences. I paint rocks, pebbles,seaweed etc on the beach. These frames are perfect for my beach scenes. Unique finish for a lake house. Fits perfectly with decor. its a watercolor of boats and I live near the water. Matches the genre of the painting it is to be paired with. framing pieces for a beach house ! Perfect! My painting is a landscape in a very natural setting on a canal. The frame has the same natural feeling as the painting. Also reasonable price. good deal today with 20% off plus the driftwood will compliment my painting of a cypress tree in Carmel California. Love the barnwood aging.....picture is of my 3 daughters lying on a dune by the ocean...very beachy looking wood! Fit the theme of the beach picture. Like the Eco-friendly concept an think it will look good with black/white photography. Looking for a frame for my beach wedding photos and this frame called out to me! Will the acrylic be above or below the linen liner? I want the linen liner to serve as a spacer for the artwork; thus, I would like the acrylic to be between the frame and the liner, protecting the liner too. When I check the dimensions of the acrylic on order, it is the same size as my artwork not the dimension of the artwork plus the liner (1-1/4"). Thank you. Where can i see the profile for bwm2 ? BEST ANSWER: Hello Hope. The profile can be found in the details tab of this frame directly below the image. It is also located in the additional images tab. Thank you! I need help framing a few canvas paintings . They range in thickness from 1” to 2” . How do I chose the correct size ? BEST ANSWER: Hello! Thank you for your inquiry. We would love to help you with your canvas framing. We have a guide located here: https://www.pictureframes.com/printing-projects/canvas-framing-guide that helps you understand the different type of frames you can use when framing a canvas. To understand if a frame will work for the thickness of your artwork you would be looking at the frame rabbet - this information is located on every product page underneath the image in the details section. You would want a rabbet that is equal to or a little larger than the size of your canvas. This particular frame you are looking at wouldn't be an ideal choice for your needs. The rabbet on this frame in only 3/8" meaning your frames would greatly stick out in the back. If you have any additional questions do not hesitate to contact our friendly framing experts at 1-800-332-8884 or via LIVE chat Monday - Friday. BEST ANSWER: Hi Gail! We prefer to use acrylic instead of glass, since it is half the weight and shatter resistant. The BWM2 frame does not automatically include an acrylic front or foam core backing. Those materials will need to be selected while placing the order. Hi there ! Will this frame fit a 3/4 inch canvas? BEST ANSWER: Hello! The depth of this beautiful rustic frame is 3/8" which will work with your 1/2" deep canvas. You will need to add canvas clips to your order since the canvas will protrude out the back of the frame slightly by 1/8". Happy Framing! Is there anyway to get the grey washed frame smaller than 5 feet? BEST ANSWER: Hello! Thank you for reaching out to us! We can certainly provide this unique frame in less than five feet. The BWM2 moulding is available from 5 inches to 42 inches. Please reach out to us by phone if need more details. We can be reached at 1-800-332-8884. Have a great day! When I select no mats or liners, does it still have borders top and bottom? BEST ANSWER: The frame does not have a border added to the top or bottom.